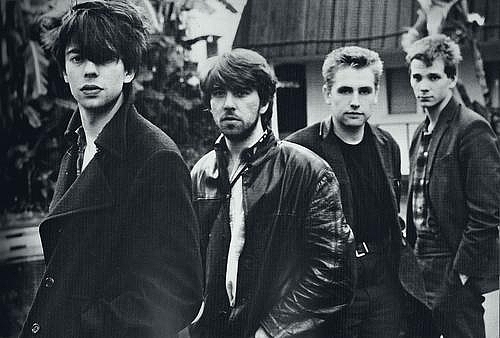 Echo & the Bunnymen are a British post-punk band formed in Liverpool in 1978. The original line-up consisted of Ian McCulloch (of The Crucial Three), Will Sergeant and Les Pattinson. There are many stories, probably apocryphal, that the quartet was completed by a drum machine known as "Echo". By the time of their debut album, 1980's Crocodiles - a moderate UK hit - the drum machine had been replaced by Pete de Freitas. Their next, the critically-acclaimed Heaven Up Here, reached the Top Ten in 1981, as did 1983's Porcupine and '84's Ocean Rain. Singles like "The Killing Moon" (later used in the soundtrack to Donnie Darko, a film whose imagery owed much to the artwork of the band's early records. ), "Silver," "Bring On The Dancing Horses," and "The Cutter" helped keep the group in the public eye as they took a brief hiatus in the late 1980s. Their 1987 self-titled LP was a small American hit, their only LP to have significant sales there. McCulloch quit the band in 1988. De Freitas was killed in a motorcycle accident one year later. The others decided to continue, recruiting Noel Burke to replace McCulloch on vocals in Reverberation (1990), which did not generate much excitement among fans or critics. Burke, Sargeant and Pattinson split after that, but the surviving three fourths of the original band reformed in 1997 and released Evergreen (1997), What Are You Going To Do With Your Life? (1999), Flowers (2001) , Siberia (2005) , and the latest addition- The Fountain (2009). The group's old audience liked the return to their classic sound, and they also managed to gain a number of new, younger listeners. Echo and the Bunnymen were managed early on by Bill Drummond, who went on to be a founder member of The KLF. 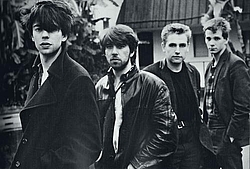 Subscribe to Echo & The Bunnymen RSS Feed to get latest lyrics and news updates. What do you think about Echo & The Bunnymen? Let us know in the comments below!